Trango needed an illustration that helped you to visualize a complex technological feature, s that it made sense at a glance, even to a non-technical audience. In my layman understanding, the Adaptive Coding and Modulation (ACM) feature basically means that even in the worst weather and heavy precipitation conditions (which usually causes errors in digital transmission of data over long wireless links), the system corrects and compensates for any missed bits/bytes, by automatically ramping the signal modulation down or up, to ensure error-free transmissions. In the past many wireless systems had to be manually modulated by network engineers in bad weather situations, which was usually too-little-too-late, as precipitation is not predictable from minute to minute. The major benefit of the ACM feature for the wireless network operators is the automated modulation which ensures that core real-time services of voice and video are not degraded, even in the worst storms. Less impacted customers means more happy customers. 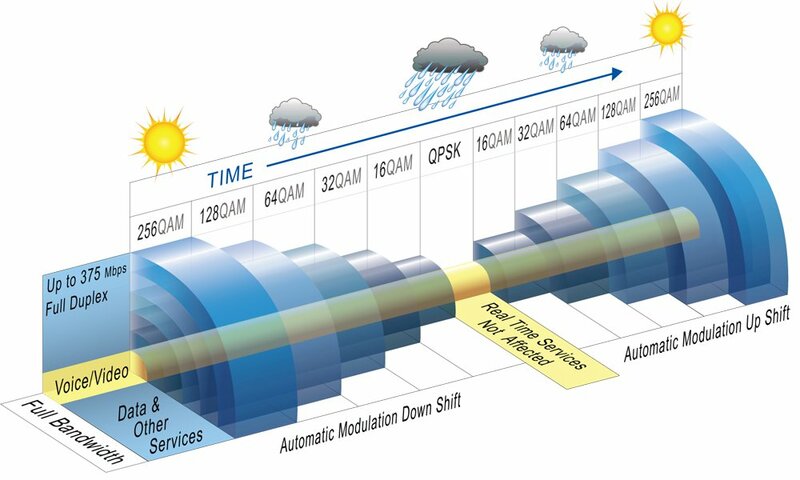 The illustration shows clearly the core signal remaining solid throughout the heaviest precipitation and how it automatically adapts over time, without any manual configuration from network engineers. All Giga Series products utilize Adaptive Coding & Modulation (ACM), which automatically changes the modulation during channel degradation events such as rain or signal fading. Each transition to a lower or higher modulation is done without dropping any Ethernet or TDM traffic and transition thresholds can be configured by the operator. When combined with the Quality of Service features of the Giga series, the most critical traffic is unaffected even in severe fading conditions, increasing overall link up-time. Do you need a technical illustration to portray your product’s benefits? Do you need an infographic to tell your brand story?